late last night I was finally able to help restore a little, teensy bit of my sanity by getting back to my beloved crafting. I made seven lamps! I was on a roll. 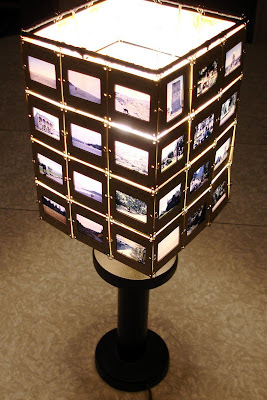 The one pictured is my favorite- made with slides from a road trip around the Pacific NW in the 1960's. I'm almost completely out of slides. But, that's cool because i'm getting excited to do some serious screen printing and gocco-ing soon. I'd love to make some special holiday gifts this year. New cuteness can be seen at my etsy shop. I'm the featured Director at Indiepix this week!